1. When your son puts on a suit for the first time, it’s a big deal. If you see him shaking the groom’s hand, congratulating him on such a lovely wedding, grab the tissues. 2. Even though you okayed having her ears pierced, you’ll cry. 3. For the moms out there who hate me for changing my “You have to be 10 before your ears will be pierced” rule (and now your : The Girl broke a terrible habit of biting her fingernails. I gave her a goal that meant something, and she did it. She deserved earrings. 4. Once you give the go-ahead, there’s no talking an excited almost eight year old out of piercing her ears. When the piercer has shaky hands and can’t draw the purple dot on your daughter’s lobe, don’t panic. Do ask for another employee to come make sure the dots are symmetrical. If all goes well, these holes will be there, like, forever. 5. When she goes to squeeze that little gun (yes, just one at a time because the other one is broken) try and ignore the tears of your already nervous babygirl when the piercer struggles bit. Let’s just say it wasn’t “quick” like taking of a band-aid or something. 6. When the same babygirl cries because they still have to do the other ear, employ her brother and friends to entertain her. It won’t work, but you’ll feel better. Summon that backup employee again. 7. When you see how different she looks with earrings, you might regret it, but her satisfaction from earning such a big prize is worth it. You’ll be proud, too. 8. When you walk past a mirror anytime for, say, the next week or so, she will stop and admire herself in the mirror. She’ll make comments about being beautiful. When you’re tempted to remind her that earrings don’t make a person pretty, and it’s what’s on the inside that counts, stop. Let her have this one. 9. As for the employee at the mall ear piercing place, can you practice on a steak or something? 10. To the guy, um, making himself happy next to the tennis courts at our match the other day. You are nasty. When we yelled, “someone call the police!” we weren’t bluffing. The police came. We have your number. I beg you to come back, but not because I want to see you again. The next time, you won’t get away. 11. If you live anywhere north of Georgia, you laugh when we shut down because of possible impending wintry mixes. To us, it’s no joke. We don’t have snow plows or winter clothes. Why would we? This happens to us once a year, if that. I’m not buying my quickly growing children snow pants and winter boots. You win. Your winter is colder. I don’t want your winter. 12. Rain boots are southern snow shoes. 13. Fact: people drink more milk when it snows. It’s a tie between eggs and bread for most popular snack. I’m not buying it. I go straight for the wine and dark chocolate. 14. No matter what you think about how we react to snow, know this: We think it’s that cool, every single time. We’ll make snow angels out of a dusting and post pics on Instagram. 15. 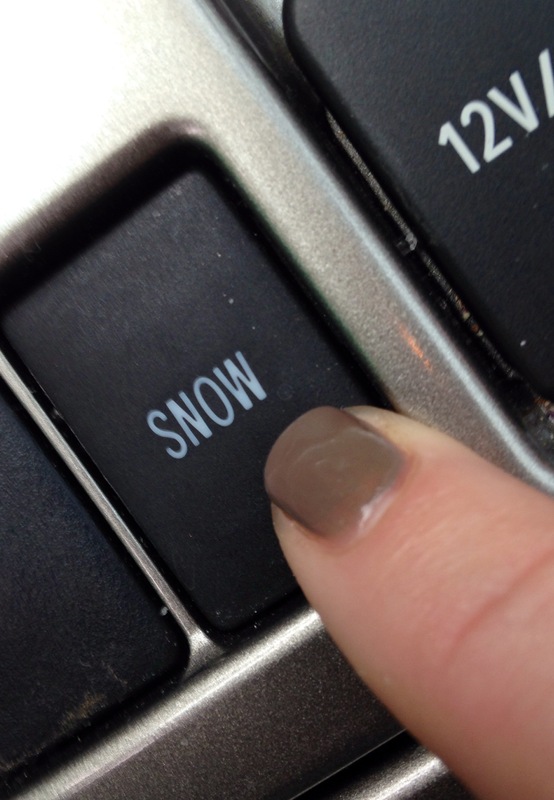 There’s a button in my car that says SNOW. I’m not exactly sure what its intended purpose is, but I pushed it. It snowed. My children think I’m MAGIC. I’m goin’ with it. Cheers! ← Liar, Liar. Now gimme your Kindle Fire.